The current minimum wage in California is $10.00 per hour for companies with less than 26 employees. It is $10.50 per hour for companies with more than 26 employees. 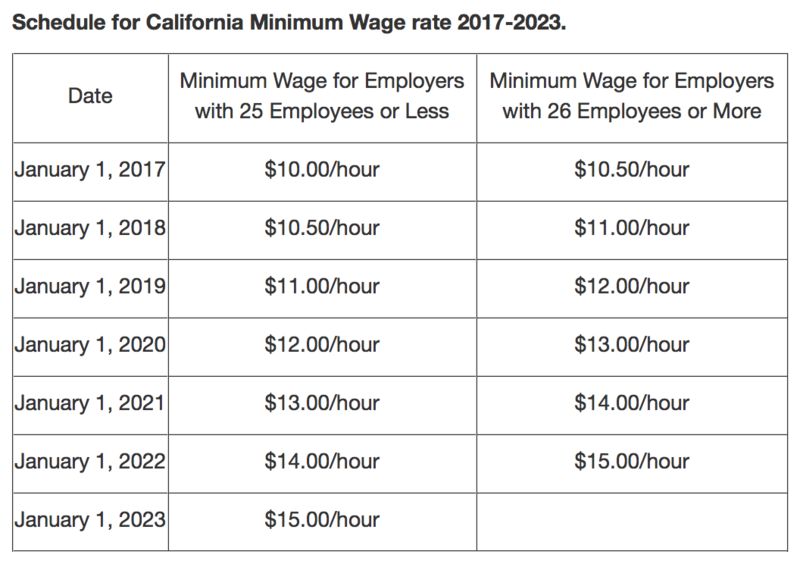 Keep in mind that the federal minimum wage is $7.25 per hour, but California law supersedes federal law here for employees working in California. If your employer is paying you less than the California minimum wage or less than the federal minimum wage, then contact an employment lawyer immediately. If you want to learn more about CA’s minimum wage law, click here. In addition, employee cannot agree to waive their right to minimum wage. For example, an employee cannot agree to accept less than $9.00 per hour in California, or less than $7.25 per hour under federal law in any state of the union. Here is a chart of the current minimum wage increase schedule put out by the Department of Industrial Relations.